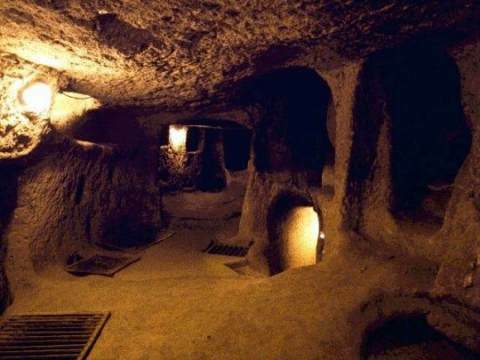 The Mucur Underground city is located in Kirsehir, in Mucur administrative district and in center Solakli. It is known to be constructed during wars and invasions for protecting from enemies. The underground city, built by carved on the soft rocks is 7-8 m depths from the land. It is also guessed that it lies down on nearby of Kirsehir Asik Pasa Tomb. The underground city is a wide having extent of view and also attractive with rooms cleaned until now, living rooms and corridors. Here, having 42 rooms today, there are narrow corridors that are constructed to pass one part to another and have a width for the people, who can move ahead only by stooping, barns for sheep or goats, temples and there are lids, having large bulky and circular-shaped stone mass that are guessed to build in order to divide the narrow corridors and to close the rooms. On the other hand, ventilation chimneys are present, opened to the of the earth.